E-commerce is the acronym for electronic commerce. Ecommerce Web design Company in Bihar,Patna designs websites that deal with online shopping and trading. It helps in selling your products on the internet without actually meeting your customer face to face. It designs the website to lead the visitor to one simple task- Make an Online Purchase. In order to tap into the huge global market, your website has to be e-commerce enabled. From root business to roof business, We offer every kind of ecommerce web design services for your website. This helps you to engage with the users online. It is a kind of selling machine that converts your visitors into Customers. We render latest ecommerce designs with dynamic product, Inventory and Order management, Shopping cart and shipping module, Payment Gateway integration, and AJAX powered interactivity. We also provide Custom background & content areas that give your business a leading place among competitors, Advanced features like "click to enlarge" and "view related products", Strategic design elements. This helps in boosting the Search Engine Optimization (SEO), Custom Home Page Designs and Custom newsletter and contact forms of your website. You may not know, but the quality of your design can make or break a sale. It can lure-in customers or drive them away. That is why it becomes necessary for your eCommerce websites to get designed in tip-top and latest ways. Our Designers consider every minor things in your website from the color of the walls of the set up to the positioning of the products to the design of your layouts. We fulfill all your needs and requirements. 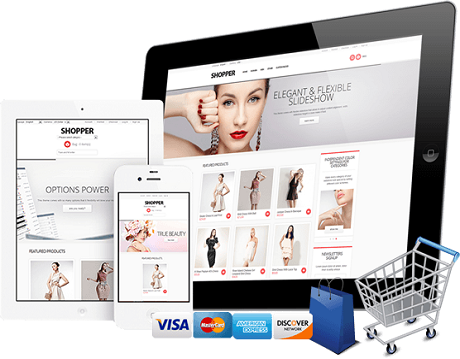 We don't leave a single chance to make your E-commerce website looks attractive.